Shunt infections: Shunt infection is a known risk for brain abscesses. Although a rare phenomenon, there have been reports of brain abscesses in children that result from colonic perforation and ascending shunt infection (27, 49, 59, 77, 121). 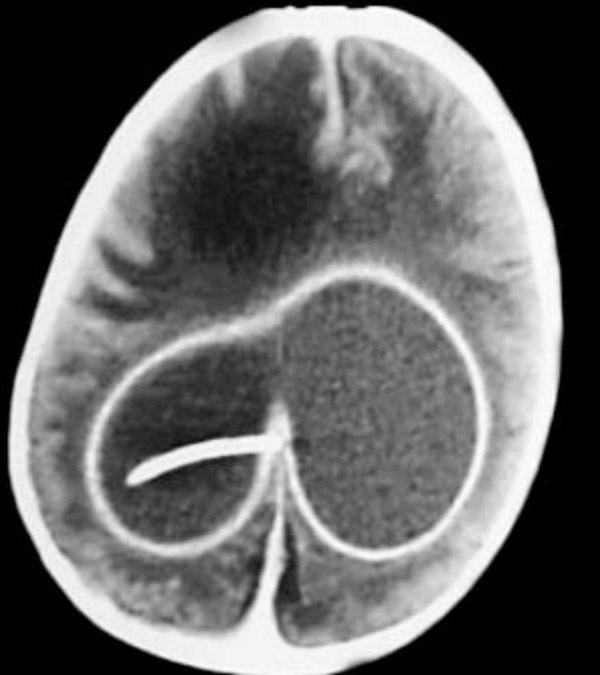 Below is an image from a child in whom a brain abscess resulted from an untreated shunt infection with no associated bowel perforation (46). Halo rings and Crutchfield tongs: There are reports of brain abscess formation as a complication of halo application and the application of Crutchfield tongs in the management of spine injury (79, 100).